It’s fall my favorite time of year. And it means the return of red wine and butternut squash. So, naturally, I had to make a fall, butternut squash recipe this week to celebrate it’s return. 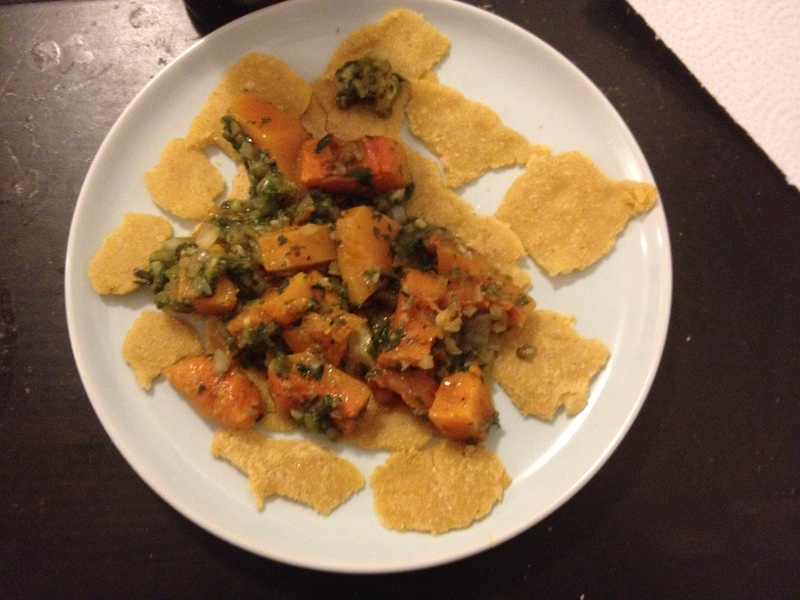 This is largely a “variation on a theme” kinda thing – linguine with kale and roasted butternut squash. Heat the oven to 400. Toss the butternut squash chunks with some olive oil, salt and pepper and roast in the oven until soft – probably 25-30 minutes. While those are roasting, saute the onion and garlic, and then add the kale. Be careful not to use too much oil. Once the squash is done, mix with the kale and veggies. Add the pasta and toss all together. Serve with Parmesan cheese if you like. So, not only was this pretty, but it was also really tasty. And it’s vegan if you don’t add the cheese. Lots of veggies, super filling, and perfect for dinner in the fall with a glass of red wine. So omg, so it’s been over a month since I last posted. Between work, finishing up some writing projects, and family craziness I’ve been neglecting cooking. But things have calmed down now and I’ll have a travel post coming in in the next couple weeks too! Song of the Week: Welcome to the Black Parade by My Chemical Romance. So it’s the 10 year anniversary of this album, and omg, I forgot how good it is and how much I like it. You should listen to the whole album, but if you don’t, at least listen to this song. I am convinced that every culture from the Mediterranean Basin through to the Pacific Ocean has some version of an eggplant-tomato dish. The French have ratatouille, the Sicilians caponata, the Persians have mirza ghasemi, and the Indians have baingan bharta. And I love all of them. So, when I found the Majorca equivalent, the tumbet, I assumed I’d like it, even if I’d never heard of a tumbet before. The Vegetarian Times website is a very nifty resource and I recommend checking it out. 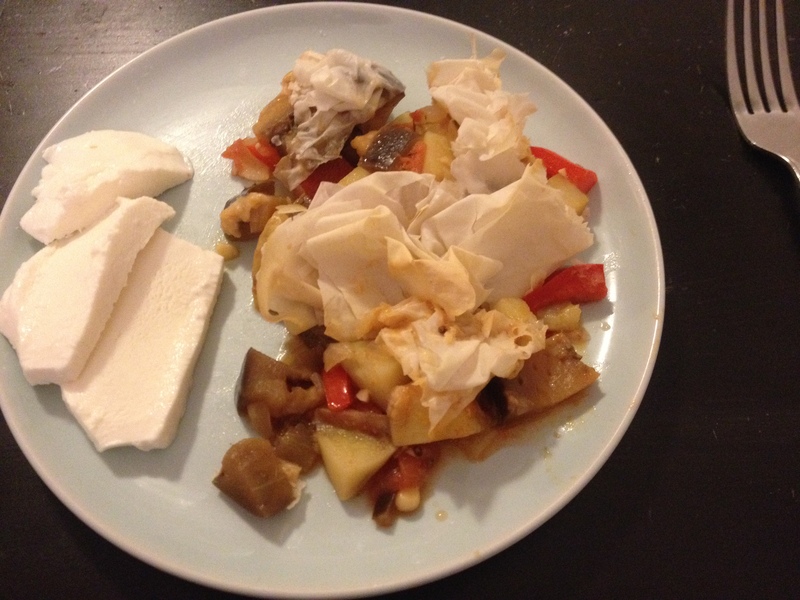 It is where I found this week’s recipe: Potato and Eggplant Tumbet. Heat the olive oil in a large pot, and saute the onions and red peppers for 5-10 minutes. Add the garlic and cook for another 30 seconds. Add all the other ingredients expect the filo dough, and a little under 1 cup of water. Cover the pot and let the whole thing simmer for about 20 minutes, stirring occasionally. Once that has finished cooking, pre-heat the oven to 350 and pour the veggies into a baking pan – trying to prevent as much of the liquid from getting in there as possible. Take a few sheets of filo dough. Brush each sheet, or part of a sheet, with butter. Then crumple it into a ball-ish form and place it on top of the veggies. Since you crumple, it’s cool if the sheets are imperfect. Keep doing that until the whole dish is covered. If you are me and think pine nuts clearly go with everything, add a handful of pine nuts and scatter across the top of the dish. Bake for 20-30 minutes, and serve warm. Result: Really good. A little too much liquid though, and that causes issues with the filo topping. I suspect there will be some reheating problems on that end too. But a solid, filling recipe that is healthy. Also, if you have the opportunity to add the pine nuts – do so. Pine nuts make everything better in my opinion. I had this with prosecco, for the completely logical reason that I had mimosas with brunch today, and so it was already open. I think I’d like this with a red though. Also, if you use olive oil instead of butter, this recipe is totally vegan. Song of the week: Star Trek fanvids. I couldn’t decide between the amazing “Closer” video and “Tik Tok” which I also love. If you are a fan, like me “Last Friday Night” is pretty good too. This week, I was at a loss for inspiration. Sad but it happens. However, this is why we have cookbooks! and food blogs! Rather than flipping through Greens again, I went through the spring and summer sections of my French Market cookbook, and in the summer section, I found something that I actually had nearly all the ingredients for. Not quite all, but close enough for me to attempt my own version: Corsican Bell Pepper Stew. Prep all the ingredients first. Heat the olive oil in a saucepan, and saute the onions and garlic for a few minutes, like five. Then add the diced (not chopped, diced) bell peppers and the rosemary. Let the whole thing stew on medium-low heat until the bell peppers have softened, about 25 minutes or so. Then add the tomatoes, wine, and salt to taste. Stew until the tomatoes have broken down, about another 15 minutes. Let the stew cool (seriously you can let it just sit for hours, it actually improves it), then splash with a little wine vinegar and adjust the salt to taste if necessary. You can serve it as a side, but I had it spread on some bread. Tasty! So tasty. It reminded me of caponata, albeit without the eggplant or pine nuts. Which, geographically makes a certain amount of sense. I’m pretty sure you could do a lot with this stuff besides sticking it on bread – which admittedly was pretty awesome. I’ll have to experiment and see how that goes. Serve with a glass of whatever wine you cooked with – and drank while cooking if you are anything like me. I went with a French rose – its late spring and hot out so I’m off red wine until fall, and French wine seemed appropriate to go with French food. Song of the week: It Wasn’t Me by Shaggy. This came on the radio when I was driving a week or so ago and I was singing along and still know almost all the words. It’s so messed up and yet. The adventures with bell peppers continue… Actually, this week I wanted to make carrot-ginger soup. It’s cold and gross out and soup seemed appealing. Unfortunately, I don’t have a blender, or food processor so, I had to go for plan B, more bell peppers. 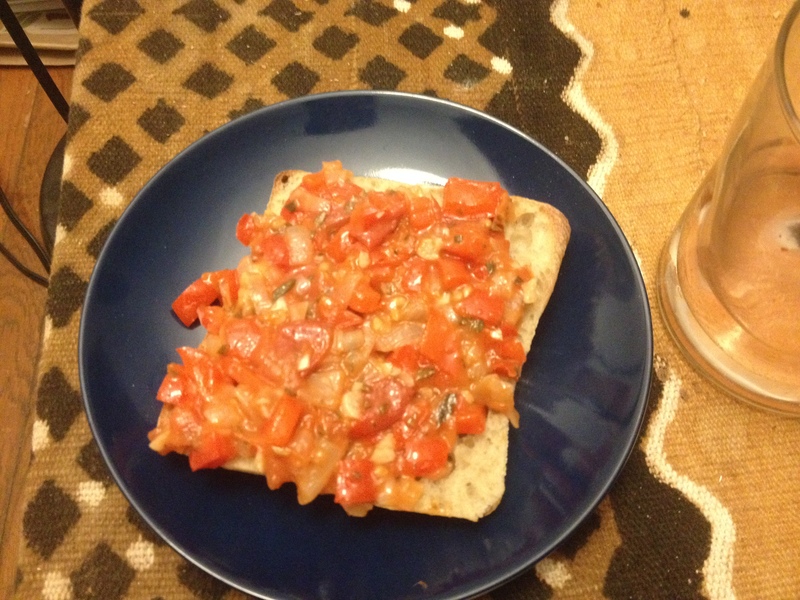 Actually, last week I found this amazing looking recipe called Mechwiya, which is a North African roasted bell pepper salad/relish thing. I seemed like a good idea, but not a meal in it of itself so, clearly, the only logical thing to do was stick it in a filo turnover. Because everything is awesome baked in filo dough. Roast the bell peppers at 400 until soft. 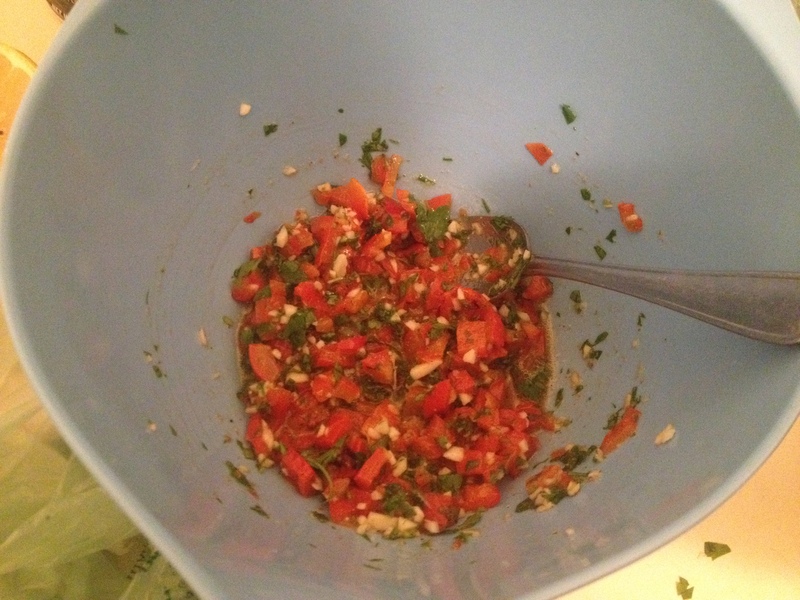 Mix the cumin, lemon juice, parsley, garlic, salt, and pepper in a bowl and mix together. Once the bell pepper is cool, chop into small pieces and add it to the other ingredients with the olive oil. Mix and let it sit and marinate for at least 30 minutes. Once the filling has marinated, take one sheet of filo dough and fold it into thirds lengthwise. Brush that sheet with melted butter or more olive oil (I always use butter because, well, butter is awesome), Place some of the filling in the bottom of the filo, and fold it up like a flag. Brush the top and any ends of dough sticking out with butter. 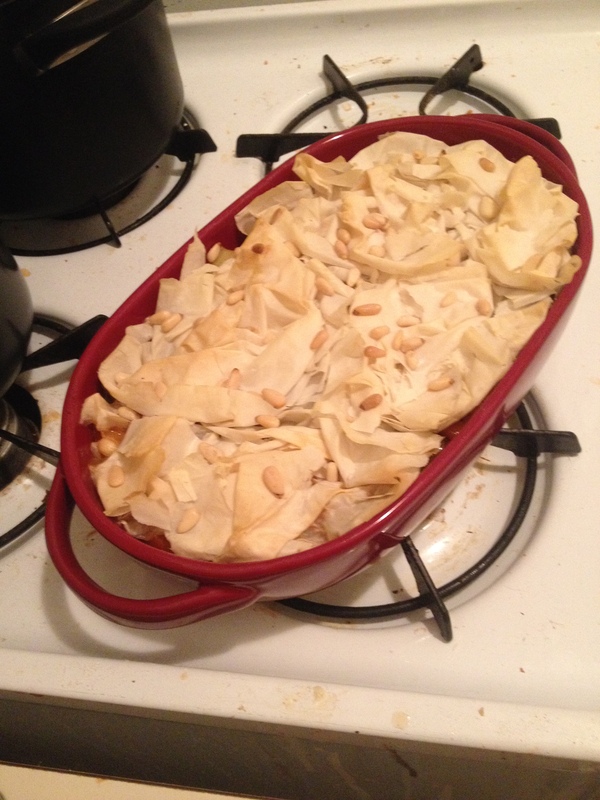 Place on a baking sheet and bake at 400 until the filo is lightly brown. Also you should probably poke holes in the filo to let steam out before you bake it, but the world won’t end it you forget. Oh my god it was so good. I had some of the remnants of the salad by itself, but in the filo, it was insane. Most things I make are really good, but this was a 10. No futzing, nothing added necessary, it was just freaking amazing. 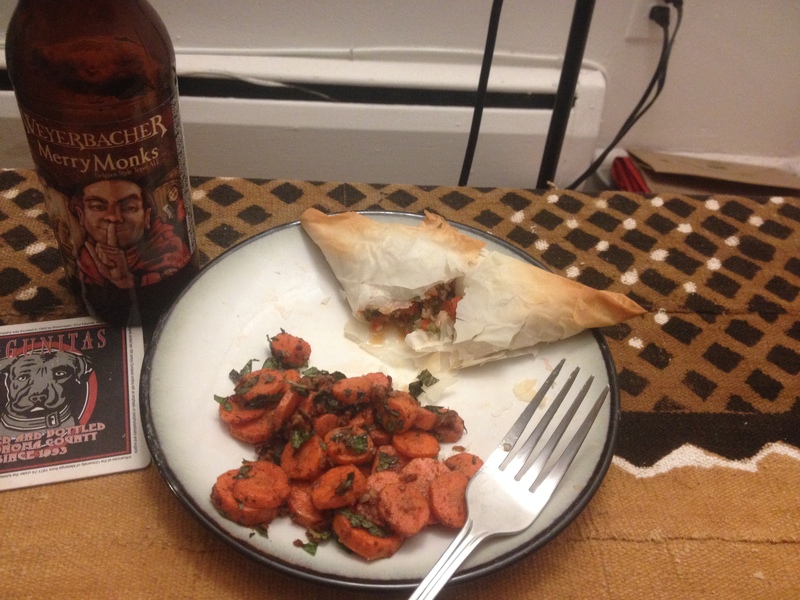 I had it with a side of Carrottes d’Afrique du Nord and served it with a Belgian tripel. Mostly because I like tripels, but I think white wine would work too. The recipe is very citrus-y and that goes better with whites than reds. Song of the week: Don’t think twice, it’s Alright by Bob Dylan. One of my all time favorite Dylan songs. There are a million covers of this song, and I listen to different versions based on my mood, but its good to start with Dylan’s original version. It’s melancholy and beautiful and everyone can relate to it. Unlike Cinqo de Mayo, Dia de los Muertos (Day of the Dead) is actually a legit Mexican holiday. Like pre-Conquista legit. Yet for some reason I’ve never really celebrated it. Maybe just because it comes right on Halloween (and Celts trump Mexicans in our Euro-centric culture). But this year I decided this would be an awesome choice for new-recipe day. After some internet research, and the sad acknowledgement that I am not skilled enough to make skull-shaped cakes, I decided to make Roasted squash with mole verde. However, I didn’t have pepitas, or more than one kind of chili and had already gone to the store, so what I made is a fairly bastardized version of mole verde. Oh well. My ancestors are Russian, so I doubt they will care. Chop the butternut squash and toss with the oil and spices until thoroughly coated. Bake at 400 degrees for 30 minutes or so, until the squash is tender (as in can be easily pierced with a fork). Once its done, remove from the pan, and let cool. While that is going on, make the mole verde. 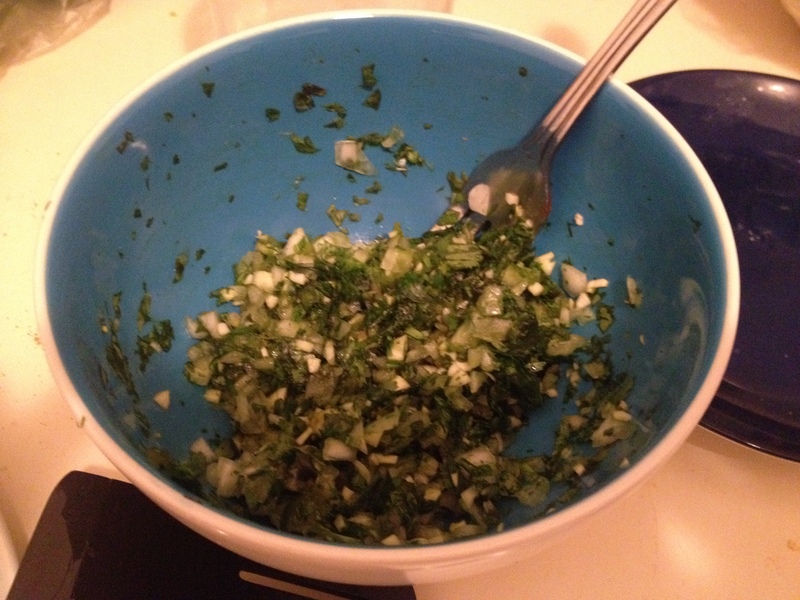 Mix the onion, garlic, pepper, and cilantro in a bowl. Remember to chop everything extremely fine. In theory, you should stick it all in a food processor, but chopping is fine, provided you make everything very small. Heat some olive oil in a frying pan, and add the onion-cilantro mixture. Saute for about 5 minutes, then add the vegetable broth. Cook for another 5 minutes or so, and then add the roasted squash. Cook until the squash are heated through, then serve. This dish is awesome. Not particularly spicy, but seriously flavorful. I’ve been making not-spicy Mexican food as of late, which is tasty, but a little peculiar. You can serve this solo, with rice, or with tortillas. I served it with home-made (yes, that’s right) tortillas which almost worked. They were a little too crumbly and fell apart, but I am still pretty freaking proud of myself. I was out of white wine (and forgot to buy tequila) so I served it with a lighter-style beer. I didn’t realize until after I’d finished making it that this meal was totally vegan. My policy is that I don’t make “vegan food” but I do make food that happens to be vegan. Song of the week: Smooth by Santana featuring Rob Thomas. Cause Santana is a guitar god (just ask Rolling Stone) and I totally love this song. And listened to it a lot while cooking. Also, fun fact, Santana is a San Franciscan.